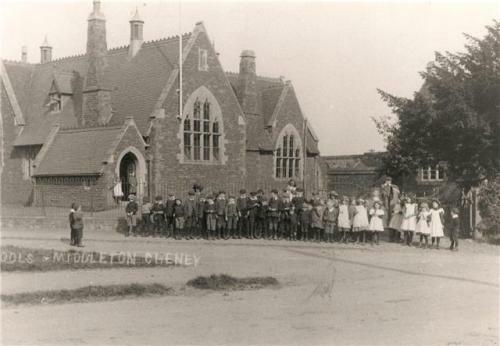 The first schools in the village started in 1750 in what is now the churchyard. A schoolhouse was built in 1753 and enlarged in 1816. A National School was erected in 1815 and the Board School, formerly the National School was re-built in 1856. 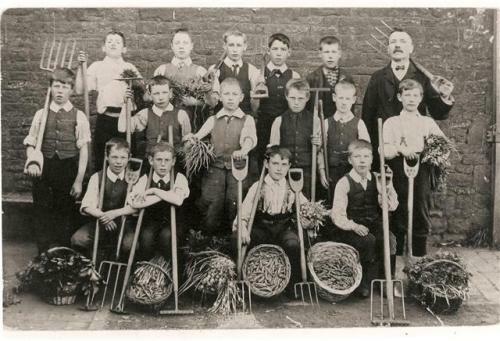 "All the boys in the agricultural villages... begin to work about the age of eight, a few as young as seven." 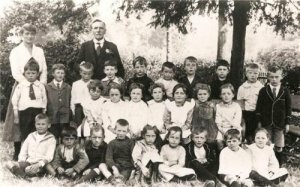 At a time when wage rates for adult male workers in Northamptonshire ranged from eleven or twelve shillings a week, the four or six pennies a day that a child could earn was a valuable addition to the family budget. "When their children are young they send them to school to get them taken care of and kept out of the way; when they become useful at home they are, as a matter or course, withdrawn from instruction without any misgiving." 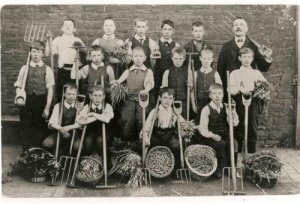 9th February 1872 – Three boys absent who were being prosecuted on Thursday for being away for three months working in fields. "We should also petition against school leaving age. It is a shame for children to be kept at school until they are 14, when at the age of 12 or 13 years they could be so very useful to their parents." The Infants are taught under adverse conditions. The room is overcrowded and one end is separated off by an old curtain, which accumulates dust and obscures light. The room is dark in the middle. The old stove should be removed (which had no guard and filled the room with smoke) and the upper part of the windows be made to open... The premises of both departments are badly arranged and overcrowded. Girls were encouraged to earn a little money before they were old enough to go out into service. Young girls in Middleton were no exception and were often taught lace making from an early age. In fact the village was notable for the fine quality of the fabric they produced. The youngsters normally began to learn their trade at about the age of five or six. Most children went to a lace "school" in the village where they were kept at work for many hours each day. They had little freedom to move and in 1814 a doctor commented on the high incidence of tuberculosis, digestive disorders and bad circulation, which led to swollen ankles and chilblains. These later disorders occurred as a result of the practise of warming feet and legs by placing a small earthernware pot of heated charcoal beneath their clothes. Eye-strain was a further hazard, especially when these young children struggled to make their lace in the evenings by the light of a shared candle. 4th July 1887 – All children to the village green to be presented with a Jubilee Medal. Later to Golby's Field (now the Horton Estate) for sports and games. 24th June 1898 – Prince of Wales passing through Banbury. Children given afternoon off. These pleasures were simple and inexpensive. As such all country children could enjoy them and they helped to compensate for the harsher aspects of their lives.